On Christmas day in 800, the Roman Patriarch Leo III crowned Charles (Charlemagne in French) as the "Holy Roman Emperor," in essence denying the status of the Byzantine Empress Irene, reigning in Constantinople. This act caused a substantial diplomatic rift between the Franks and Constantinople, as well as between Rome and the other patriarchs in the East. Though the rifts were settled to some degree and the Church in Rome in theory remained united with Constantinople and the rest of the imperial church, from this point forward East and West followed largely independent paths culminating in the Great Schism. In the 9th century, Byzantine Emperor Michael III struggled to appoint Photius as Patriarch of Constantinople, and Pope Nicholas I struggled to keep Ignatius there. After Michael was murdered, Ignatius was reinstated as patriarch without challenge. An ecumenical council in Constantinople, held while Ignatius was patriarch, anathematized Photius. With Ignatius' death in 877, Photius became patriarch, and in 879-880 a second ecumenical council in Constantinople annulled the decision of the previous council. The West takes only the first as truly ecumenical and legitimate. The East takes only the second. But in addition to the dogmatic issue raised by the filioque, the Byzantines argued that the phrase had been added unilaterally and, therefore, illegitimately, since the East had not been consulted. In the final analysis, only another ecumenical council could introduce such an alteration. Indeed, the councils, which drew up the original Creed had expressly forbidden any subtraction or addition to the text. In 863, a mission from the Patriarch of Constantinople converted Tsar Boris I of Bulgaria to Christianity. Boris realized that the Christianization of his subjects by the Byzantine mission would facilitate the undesired spread of Byzantine influence in Bulgaria, as the liturgy was carried out in the Greek language, and the newly established Bulgarian Church was subordinate to the Church of Constantinople. A popular revolt against the new religion prompted the king to request that the Bulgarian Church be granted independence by Constantinople. After the First Bulgarian Empire was converted to Christianity, it started a massive missionary expansion north and east. 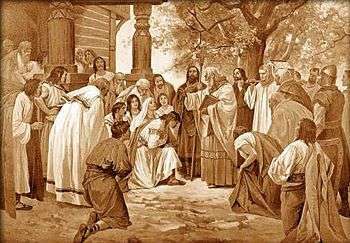 As a result, it was able to convert and help convert many East Slavic peoples and introduce to them Bulgarian books and Church literature in Bulgarian, most notably the Rus' (Ruthenians), predecessors of Belarusians, Russians, and Ukrainians/Rusyns. 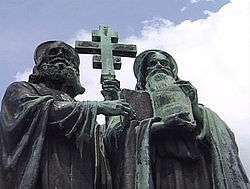 By the beginning of the 11th century most of the pagan Slavic world, including Russia, Bulgaria and Serbia, had been converted to Christianity. 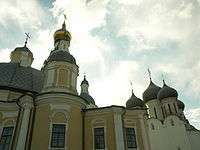 Between the 8th and the 13th century the area was settled by the Kievan Rus'. An attempt to Christianize them had already been made in the 9th century, with the Christianization of the Rus' Khaganate. 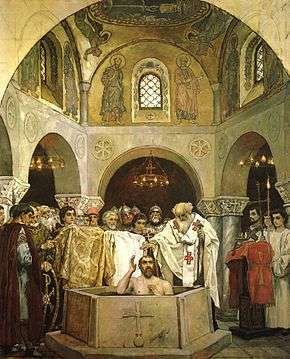 The efforts were finally successful in the 10th century, when about 980 Vladimir the Great was baptized at Chersonesos. ↑ "Archived copy". Archived from the original on 2008-05-13. Retrieved 2016-02-06.